Made by My Doll Best Friend. By manufacturing our own high quality doll clothing we're able to keep prices down for our customers. All My Doll Best Friend manufactured doll clothing is priced affordably. Easy for young children to dress their dolls. Stunning fuchsia pink hairband to fit all the dolls on this website. Stitched with ivory pearls at the centre of the bow, this beautiful hairband will match party clothes and casual clothes alike. 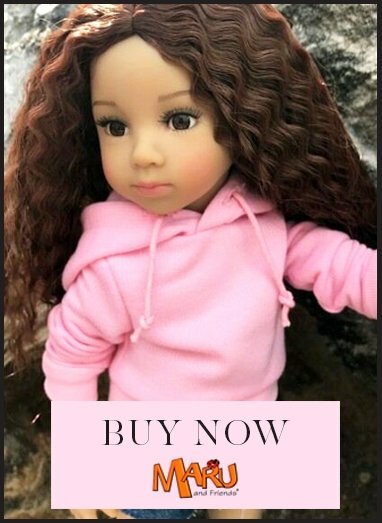 This dolls hair accessory is fully elasticated so that it fits the smaller head size of the Kidz 'n' Cats dolls as well as the larger heads of Amerian Girl dolls, perfect if you have a collection of dolls who like to share clothes! This item will fit brands of doll including Gotz Precious Day, Hannah, Happy Kidz, American Girl, Our Generation, WeGirls and Bonne & Pearl, plus similar sized dolls - and Kidz 'n' Cats!